We ended our jaunt through Illinois, Wisconsin, Michigan, and Ohio at Fostoria, Ohio. Mary Ann and I had not been to Fostoria since they opened the new railfan park, and Grayson had never been here. As we rolled up to the park, crossing gates came down in front of us. Both Grayson and I got out to grab a quick photo, but the locomotives of the CSX southbound train were by us before we could set up. Grayson was now happy as we would shoot some CSX trains. Then, out of nowhere, came a northbound CSX train. Some quick camera action got us some usable photos. Mary Ann’s part in this was to tell us to be careful and stay behind the gate. The city of Fostoria has set up a very nice railfan park, even it does face Norfolk Southern track instead of CSXT track. We would spend seven hours here, 10:00 A.M. to 5:00 P.M., watching and shooting the trains running by. Again as at Rochelle, Grayson and I ventured outside of the Park’s fence line to grab some different angle shots but, as always, under the watchful eye of Mary Ann. We had the lunch Mary Ann had packed at the park’s tables and used the very nice clean restrooms. During our lunch, Grayson had an accident with a bottle of orange juice and Mary Ann used the restroom to change Grayson’s clothes. We had planned to stay the night at Fostoria, but I had failed to make room reservations at the Best Western Motel. Thus, we had to run over to the Interstate to find a room, and the next morning orders were to head south for home. According to Mary Ann, we had had all the fun our systems could take. 1. 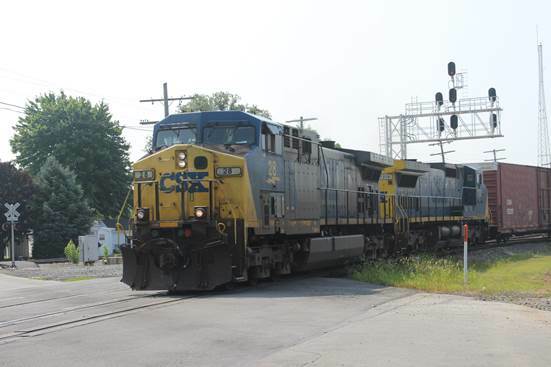 We catch CSXT 42 and 785 at a grade crossing as we prepare to enter Fostoria’s Railfan Park. 2. 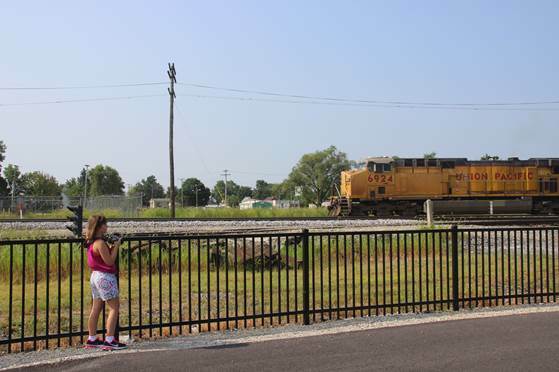 Grayson setting up to take a photo of UP 6924 running north on CSXT track. The fencing around the park was almost too high for Grayson to shoot over. 3. 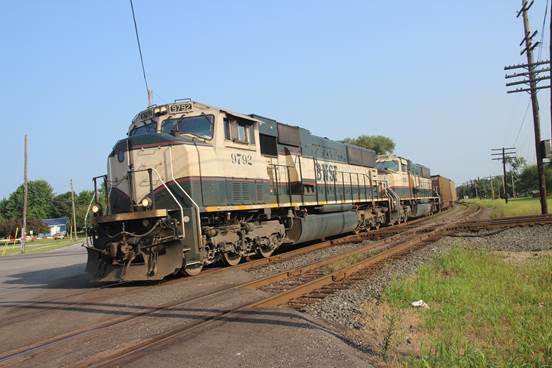 We stepped outside of the fence line to get this shot of CSXT 28 and 7376. 4. My old camera that Grayson was using has a 50 mm to 300 mm lens, and by the time we got to Fostoria, Grayson had learned how to move between close up and distance shooting. 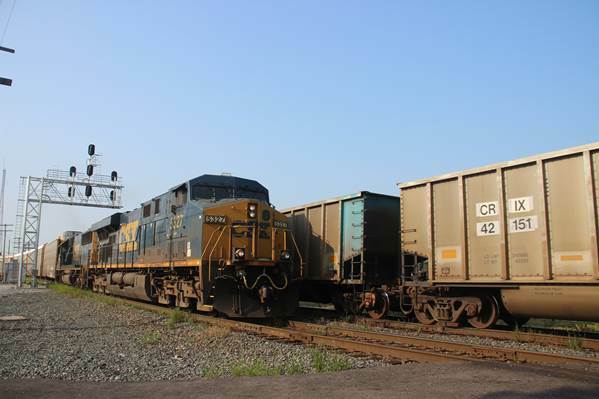 Here CSXT 7789 and 9035 approach F Tower. 5. 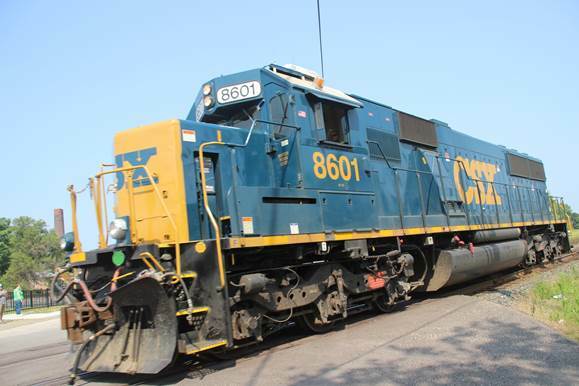 CSXT 8601 was caught running light. 6. 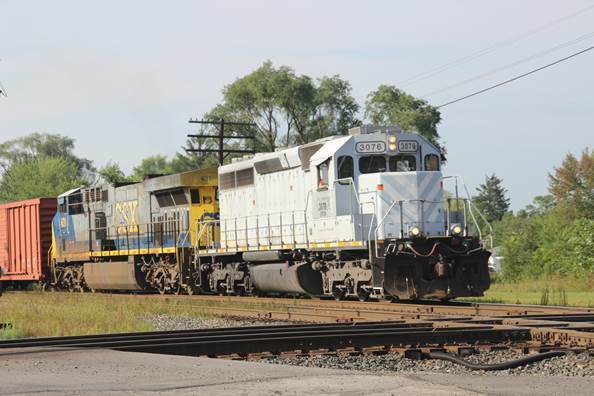 A manifest train headed by GFOX 3076 and CSXT 631 is seen preparing to hit the diamond. 7. CSXT 5327 with CSXT 8531 blast by at track speed with a unit train of autoracks. 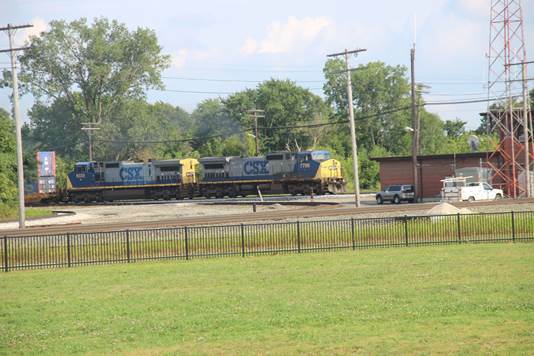 The following two photos show the disadvantage of shooting CSXT trains from the rail park’s viewing platform. 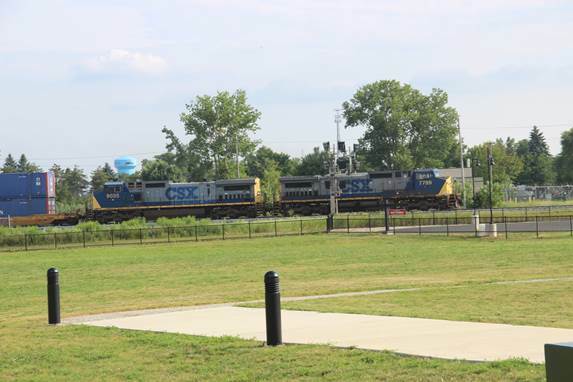 CSXT trains run past the park some 200 yards away from the viewing platform. 8. 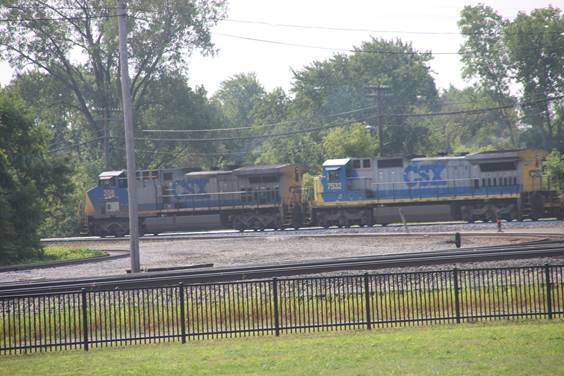 In this photo, CSXT 208 and 7532 have just passed F Tower north bound. 9. 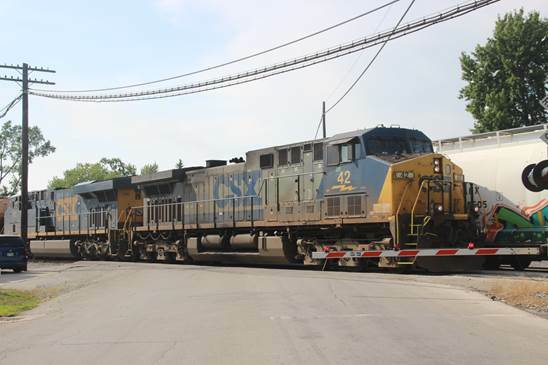 In this photo, CSXT 7789 and 9035 are heading south under the approach signal for F Tower. 10. We caught and photographed a number of trains headed by BN-SF power running past the Park. 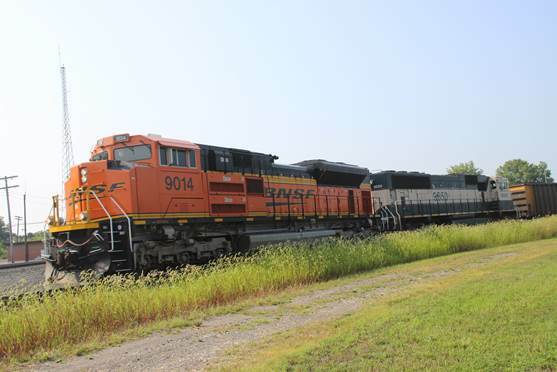 Here we see BN-SF 9782 and 9862 rolling across the diamond. 12. 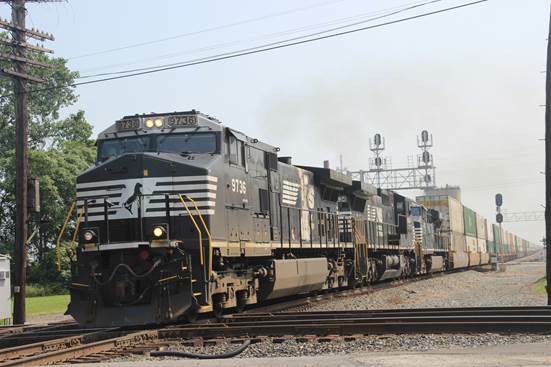 Grayson closed the day with this shot of NS 9763, 8434, and 7570 crossing the diamond with a stack train. A day of too much fun comes to an end as Grayson, falls asleep on one of the Rail Park’s benches.